The product contains the standardized extract of Maitake D-fraction, the base for recent studies on the immune-enhancing properties of Maitake which has been used clinically by a number of health-care professionals and received overwhelming acceptance. * Grifron® Maitake D-fraction® finally became available for the retail market in capsule form as a result of strong demand for the product from retail stores as well as end-user customers. Maitake D-fraction® is the registered trademark of Maitake Products, Inc. and no product is allowed to be marketed under the tradename unless licensed by us. Suggested use: As a dietary supplement, take 2 capsules twice a day between meals or as directed by your practitioner. What is D-fraction? Modern science has identified a unique polysaccharide compound, 1,3 branched 1,6 beta-glucan and 1,6 branched 1,3 beta-glucan in Maitake mushroom, which is the active constituents that support immune cell function. * Unlike other 1,3 beta-glucans seen in other medicinal mushrooms such as reishi or shiitake, also in some yeast cells, Maitake's 1,6 and 1,3 beta-glucans have more complex chemical structures with greater degree of branching, which may increase the chances to reach to each immune cell for activation. * Maitake D-fraction is the combination of this 1,6 and 1,3 beta-glucans and some protein. It is most effective when taken orally. It is very important that D-fraction is effective in oral administration, because any pure beta-glucan alone is only effective through injection. Product Specifications: Each Grifron® Maitake D-fraction® capsule contains 3mg of pure D-fraction compound (10mg of standardized pre D-fraction powder) , 150 mg of Maitake fruit body powder and 10mg of vitamin C. No : sugar, yeast, mold, artificial colors, dairy foods, preservatives and chemical pesticides or fertilizers are used. 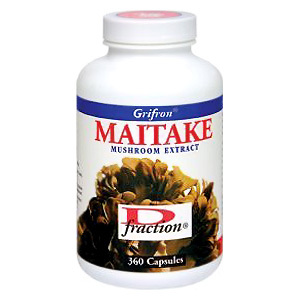 Grifron® Maitake D-fraction® capsule is available in two sizes; 120 capsule bottle (suggested retail price of $29.95) and 360 capsule bottle (suggested retail price of $79.95). For general use and for maintaining your health, please take 2 capsules twice a day between meals. (For those who seek digestive support, please take them with food). For maximum impact, double or triple the daily amount, or use as instructed by your health-care professional. Toxicity: There is no toxicity found with Maitake D-fraction extract nor whole Maitake mushroom, even with large dose. Please remember Maitake is a popular culinary mushroom in many countries for hundreds of years. However, although it is very rare, whole Maitake mushroom may cause light upset stomach or soft bowels. 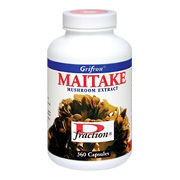 Applications: Grifron® Maitake D-fraction® is specially geared for the people who seek enhanced immune system function*. Other Ingredients: Dicalcium Phosphate, Cellulose, Silica . It contains NO sugar, yeast, mold, artificial colors, dairy foods, preservatives, and chemical pesticides or fertilizers. Keep out of the reach of children. Consult a physician before using if pregnant or nursing. Store in a cool, dry place. This product is safely sealed for your protection. Do not use if seal is broken or missing. Grifron Maitake D Fraction - is shipped in a discrete, unmarked package. Orders are processed immediately and usually take about 3 to 5 working days to be received. We do ask that you try it for 2 to 3 weeks to feel the full effects. Any information received is used only for order processing and shipping purposes. Your information, such as e-mail address, will never be disclosed to a third party.